Putting out hummingbird feeders is more critical than ever this year. The extreme drought that is affecting much of the southwest, where migrating birds concentrate, will create enormous hardship, since natural sources of nectar will probably be few and far between. The Ruby Throated hummingbird, for example, must gain up to 40% of their body weight to make it across their main migration route, the non-stop 300 - 400 mile Gulf of Mexico, before landing in Mexico. With the Texas drought, I don't know if they will have enough nectar sources to gain that much weight. Therefore, supplemental feeding is critical. Also, research has proven that putting up feeders will not prevent migration. Fall migration is in full swing, I have 3 feeders out now and going to 5 soon. 4 to 1 water to sugar, dissolve with hot water. Change water every 2-3 days to prevent spoilage. Keep feeders in various locations, as far apart as possible, to minimize fighting and one bird guarding them all. Hummingbird migration is happening or will soon be happening all across the US (usually in late August through September, sometimes later). Most of the hummers will migrate to areas in Mexico. A few, such as the Anna, are US residents year round. 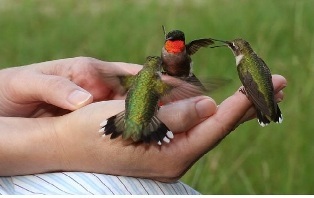 East of the Rockies, you will primarily see the Ruby Throated hummingbird. West of the Rockies, you may see Black Throated, Broad-tailed, Broad-billed, Calliope, Rufous, Allen, and Costa’s, plus even more if you live in Arizona. This information is courtesy of Forum moderator Tony Manasseri. If you have questions on this newsletter or any other topic, tune in this Sunday from 8am - 11am CT to the Dirt Doctor Radio Show. Listen on the internet or click here to find a station in your area. Please forward this newsletter to share it with everyone in your address book and all your friends on Facebook and Twitter to help me spread the word on organics.